Note: Today’s workout is the first of several KravFIT workouts designed by Greg Amundson. KravFIT incorporates the self defense principles and ranges of motion of Krav Maga with the foundational skills of CrossFit. The result is a super challenging workout that forges elite fitness and combatives at the same time. Get ready, it’s gonna be a good one! 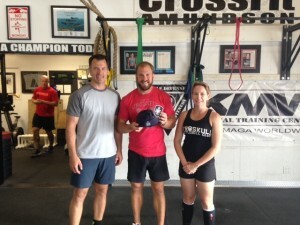 Australian National Police visit CrossFit Amundson! 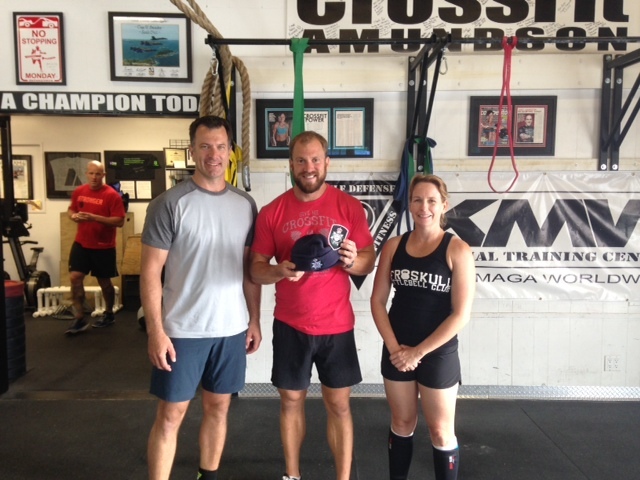 Last week Mark and Hayley Haggerty visited our gym all the way from Sydney, Australia! Mark serves as an Australian Federal Police Officer. Following the workout, Mark presented Greg Amundson with the official Australian Federal Police shoulder patch and watch cap. Thank you Mark and Hayley for your generosity and for visiting our gym.